Bonhams’ Goodwood sale includes the Glasius Lotus Collection, featuring quite a few rare, storied Lotuses (Loti?) including race cars, road cars, and concepts. This 1956 Eleven is a wonderfully restored example that has an important competitive background. 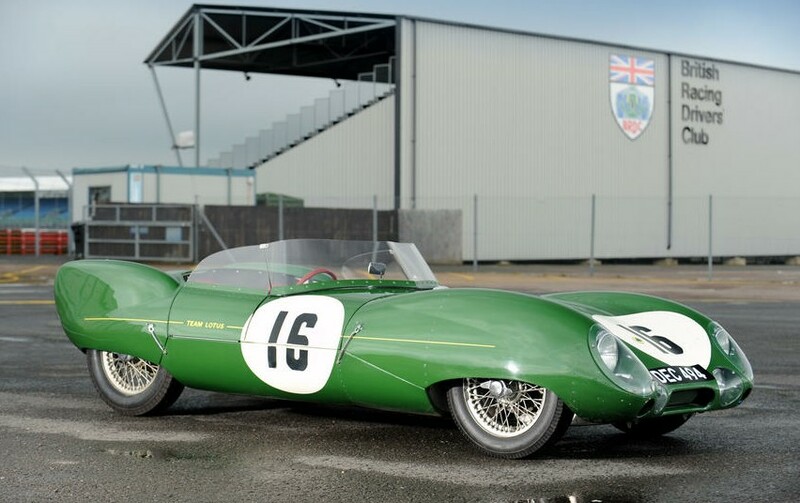 The Lotus Eleven was introduced by Colin Chapman in 1956. It featured this slippery body designed by Frank Costin, brother of Cosworth co-founder Mike Costin. (Frank Costin would go on to co-found Marcos before building a few cars that bore his last name in its entirety). The ‘Le Mans’ spec car had the option of a 1.1-liter (FWA) or 1.5-liter (FWB) Coventry-Climax straight-four. This one has the 1.1-liter and the standard tubular space frame, for a weight around 1,100 pounds – making it capable of over 130mph. This car does not have the headrest that was fitted to some of the later models (the Eleven was produced up to 1958). About 270 were built, inclusive of all versions. Proper sporting cars should have a competition history – as this one does. It was a factory Lotus team car that competed in the 1956 24 Hours of Le Mans with drivers Cliff Allison and Keith Hall. A retirement – when Allison hit a dog on the Mulsanne Straight – placed the car 26th in the standings. After the race, the car ended up in the hands of an American and passed through an unknown number of owners before it was finally restored to the as-or-better-than-new condition it is in today. This Eleven – with Lotus factory racing history – is being offered in this glorious condition for the first time. It is estimated to sell for between $210,000-$270,000. For more information click here. And for more from Bonhams in Goodwood, click here. This entry was posted in Uncategorized and tagged 1956, auctions, Bonhams, cars, classic, classic cars, le mans, lotus, race cars by classiccarweekly. Bookmark the permalink.